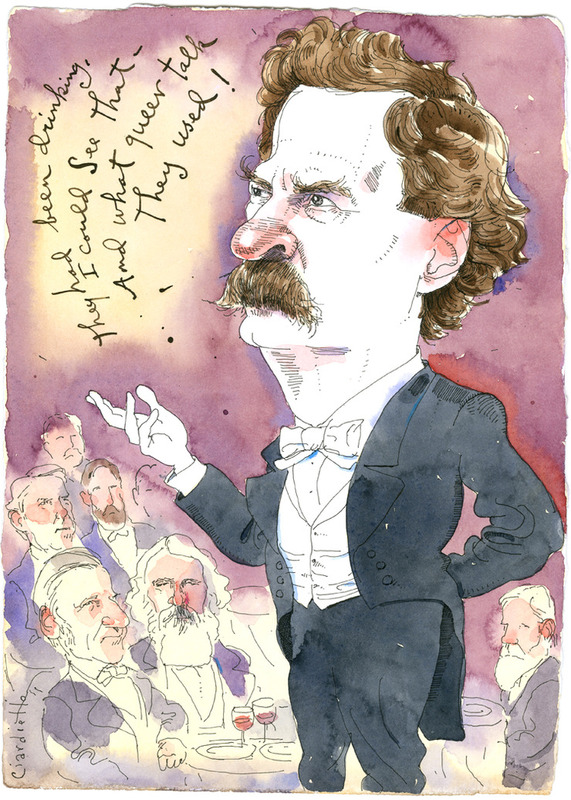 Here's a Mark Twain I did a little while back for Humanities magazine. It was for an article about an infamous toast Twain gave at a dinner where drinks were flowing freely. Among the distinguished guests he insulted were, Henry Wadsworth Longfellow, Ralph Waldo Emerson and Oliver Wendell Holmes. All these beautiful Twains. Now I feel like I am the only one who didn't get Twain commissioned :-b Missed my steamboat!! A beaut. It's nice to see a portrait of Twain before the hair went white. Nice portrait, and great colours. I also love Emerson's expression. Love the way you incorporate the background likenesses with such simple authority and how your writing always feels like a natural extension of the drawing. Fierce looking Twain, Joe; love it. Emerson appears to need to excuse himself and attend to his sideburns. Another bloody great drawing, Joe. Crackers, what a wizard! Great stuff, Joe! You got to the core... again.